Alaska Steel is a large advocate of team spirit and employee morale, inside and outside of the office. A small group in the Anchorage branch has put together a summer softball team to help show off that spirit and is being led by head coach/manager Kelsey Hoffner. “It’s a way to get everyone together and stay in shape over the summer,” said Kelsey. 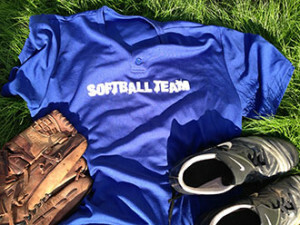 The team, appropriately named ‘Softball Team’ is a playing under the Co-Rec division in the Anchortown Sports League. Co-Rec teams consist of usually seven male players and three female players. Our sporting bunch of employees consists of Kyle McBride, Maynard Gates, Wes Bass, Matt Johnson, Kerry Osbourne, Skyler Plonta, James Price, Shane Waldron, Kelsey Hoffner and All-Star Softball Champion Chris Glover. The team will be out on the field all summer in full matching regalia from May until August. The games will be held at the DeLa Vega Complex in Anchorage. Contact Kelsey Hoffner at Alaska Steel’s Anchorage branch for game days and times. Make sure to get out there and support the team!